You might wonder what remote control has to do with test and measurement. And you might be pleasantly surprised when you find out. For a number of years now, manufacturers of broadcast equipment have used remote controlled test installations to allow them to test systems and modules for compliance against a huge array of broadcast and non-broadcast video formats and test patterns. Remote control is one tool that allows manufacturers to quickly check if the equipment under test meets its specification as well as providing documented test results. In these types of test installations scripts are used to select functions (such as video format and test pattern choice) and control the test equipment without the need to manually setup each test in turn. Away from the factory, however, the equipment under test may be down in the depths of the building and being temperamental. You need to find out what is going wrong but you dont want to spend the whole day standing over it waiting for it to go wrong. Here automated remote controlled testing does not help you. The solution here is remote monitoring. But what can you sensibly monitor? With over 400 different format combinations in broadcast and production worldwide, manufacturers have to design and test equipment that may need to support all or a large subset of these combinations. These have to be tested both in development and in production to ensure that they are compliant with SMPTE and EBU specifications. To do this the tools available within products such as the PHABRIX Sx and Rx instruments can be used. Automated scripts and remote control can be used to make systematic selection of generator test patterns, video formats, line rates, frame rates, colour spaces, bit depths, etc while the equipment under test is monitored and errors reported using the inbuilt logging system. 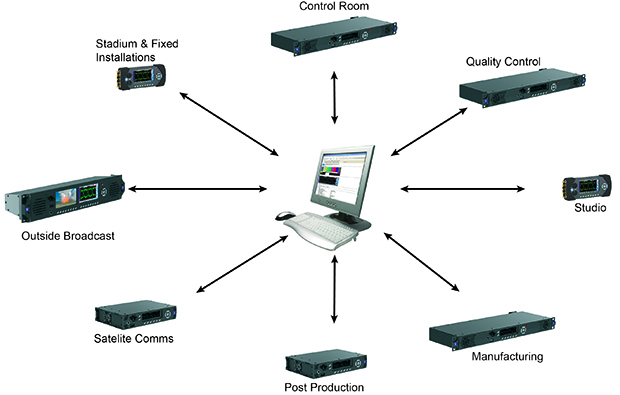 This approach to large scale testing for compliance has been adopted by manufacturers such as AJA (using scripts in production to test their units for CRC errors), Snell (production testing switchers) and Quantel (production testing SD-SDI, HD-SDI and 3G-SDI functionality of their sQ server range). With tools like SNMP you can only detect issues or error conditions that have been programmed to be trapped. This doesnt help you if the problem is with video signal itself or with equipment stability especially as most SNMP implementations are for un-manned computer automation and therefore can be difficult to operate manually. Ideally you need to place a piece of test equipment next to the problematic equipment and remotely monitor the findings of the test equipment and change parameters on the fly. Depending on the type of problem, you may want to log issues over time or you may want an alert when some parameter fails. Being able to remotely monitor the test equipment allows you to keep an eye on it while you go about your normal activities. In many organisations remote monitoring of equipment has become an essential activity for keeping the studio running and programs on air. Video test systems need to allow you to remotely capture video data and deliver it locally for analysis via a standard network cable. This, however, only goes someway to help diagnose issues remotely. Being able to intuitively control the test equipment remotely, including changing test patterns, analysing specific waveforms, checking data and viewing error logs as well as having a graphical view of the equipment is a significant advantage. Some test equipment provides an option for a physical remote control panel that allows the equipment to be controlled over long distances but with this type of system the control interface video signal also needs to be routed to where the user sits. New web browser technology, available on some products, allows them to be remotely controlled and monitored from a desktop browser window (such as IE, Firefox, Safari, etc) and can provide a snapshot of the test equipments operating screen, as if it were being accessed locally. Using a standard web browser allows you access to the test equipment anywhere there is a network connection. The front panel of the test equipment can be controlled using a browser window and is accessing the equipment via the local area network. Clicking with the mouse on the on-screen buttons controls the test equipment itself. This allows the selection of individual instruments, the selection of test parameters and displays a snap shot of the actual waveform display. Here the display information is a relatively small screen area as it is only representing a hand held instrument. Where the test equipments control surface is a high resolution display then the amount of information that can be obtained from this display can be vitally important when trying to track down an elusive issue. A whole array of instruments, available on the PHABRIX Rx rasteriser 1920 x 1080 screen, can be controlled remotely using a browser window and mouse. One of the most significant advantages to this approach to remote control is that if you are familiar with how to use the test equipment you dont have to relearn how to use it remotely or possibly even worse have to access it via some 3rd party application. Something you dont necessarily want to do when trying to diagnose a problem with another piece of equipment. Being able to understand a familiar display directly, and interact with it, can simplify the fault finding process. This is primarily because the results of any testing are displayed graphically and anything out of the ordinary can be seen immediately in a recognisable way. In some cases remote monitoring allows different functional areas of the equipment to be investigated and can allow video waveform analysis, video metadata analysis, input timing, audio levels, audio loudness and error logging which can have enormous advantages. 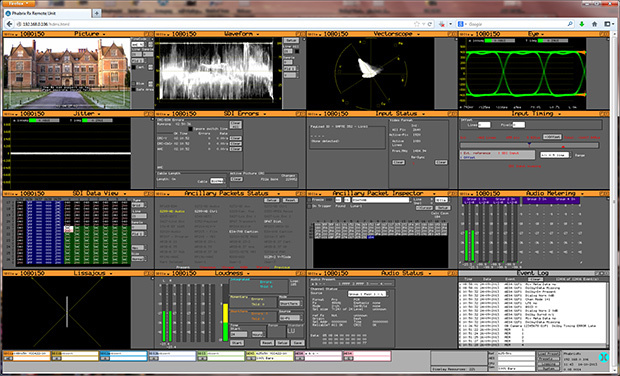 Take for instance being able to remotely view a waveform monitor display that allows you to immediately see if there is something wrong with the levels, gamut and balance. Being able to see the presence of metadata and being able to analyse it can go a long way to determining if the structure of the SDI data is correct. Also being able to remotely check input timing can identify locking reference issues and mistiming between video sources. When there are audio problems, having access to the audio levels and to loudness measurement is essential for compliance. If there are intermittent issues, then being able to remotely setup different event triggers and logging the events to see if there was any effect can identify an elusive error. Another significant advantage of web browser remote monitoring is that multiple areas within a large organisation can be monitored and viewed from a single computer. As the number of broadcast and production formats increase, manufacturers will become more and more dependent on test equipment that allows the automated compliance testing of their products both in the lab and in production. The trend in broadcast, as elsewhere, is to create broadcast systems of more and more complexity and sophistication. The probability of things breaking and potentially becoming harder to diagnose therefore increases. Remote monitoring is essential for spotting issues as they arise but needs to be useable by engineers who understand the equipment being monitored as well as giving them the tools to quickly diagnose the underlying cause.